Today, the importance of WYSIWYG technology is not a negotiation. 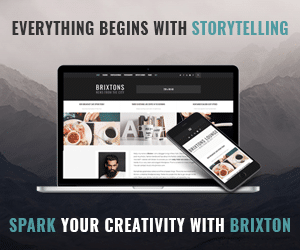 ‘What you see is what you get’ – is a perfect way to build or customize your web design. It doesn’t require coding skills and promises you a fast, pleasant, and stress-free work. We used to pay big money for primitive websites and work with the so-called poor builders. Happily, in 2018, life becomes easier. Nowadays, website owners have a possibility to work with the top-notch technologies without running out of the budget. Moreover, the choice is so rich that you can’t just stop on one website template. How to decide, which product to use? In this post, we are going to compare the most popular flagships: Monstroid 2, Avada, and Divi. Among all the widely known editors, there is a comfy Elementor. 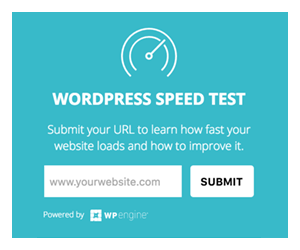 It comes for WordPress-based online projects. Elementor is an intuitive WP content editor, which is a real must-see for anyone, who’s going to work with visual editors. All the fresh, for instance Sports WordPress templates already use it. You can visit Elementor marketplace to view out a rich collection of such products. Inside the marketplace, a user will see lots of front-running Elementor-ready themes. Besides, there are many ready-made pages, presets, and plugins. 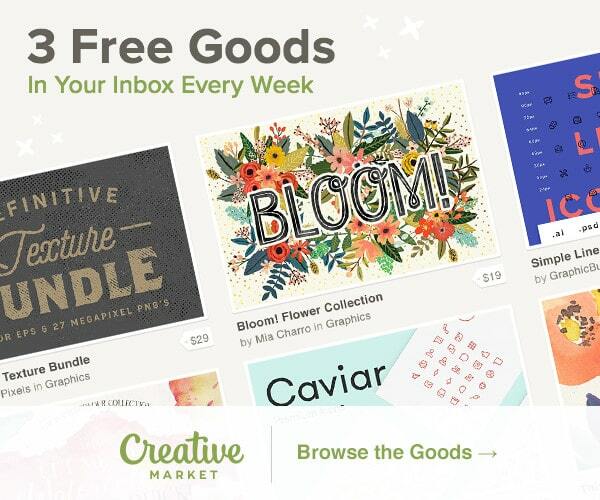 Today, the marketplace is the biggest collection of Elementor-related web design items. Without a doubt, you’ve already heard of these flagships. Talking about Monstroid, it’s a creator-friendly WordPress theme made by ZemezJet team from TemplateMonster. The first release of Monstroid 2 took place in 2017. And, although the product receives the regular upgraded, August 2018 it has a huge update. Now, choosing Monstroid 2, (or just updating the old version to the current one) you get full-fledged Elementor functionality and support. On the other hand, inside the pack, there are multiple new UI elements. We’ll will tell you more about the fresh Monstroid 2 updates below. The next popular thoroughly created WordPress template with WYSIWYG editing is Avada. Being multipurpose, the flagship comes with lots of niche demos to choose from. The first and only official release was in 2012 by ThemeFusion. However, you can see many new demos added since then. That’s why Avada meets today’s requirements. Inside the template, there’s a custom visual editor – Fusion builder. Moving to Divi, it’s a famous flagship from ElegantThemes. The template is fully visual editing friendly and comes with a cool easy-to-use editor that allows viewing the content changes live. The current version of the template is Divi 3. The first release was September 2016. Also, April 2018, Divi was updated to 3.1 version. It got new ways to customize content blocks and some extensions. As you can see, each of the selected WordPress themes for WYSIWYG content creation is multipurpose/ multifunctional. Inside their packs, a user will find many designs to build the very website. Which skins will you get? The next WordPress flagship don’t have templates. They have skins instead. On the first hand, Avana contains more than 30 skins that covers multiple business niches. Don’t forget that you can preview all of them. What about Divi? Needless to say, it comes with skins as well but the variety is not as rich as if you open Monstroid 2 or Avada packs. Inside Divi, a user finds 7 built-in skins. Plus, there are a few universal skins as well. Without a doubt, the more content blocks your theme or template provides, the more chances you have to get the design of your dream. How many UI elements Monstroid 2, Avada, and Divi contain? In addition, Monstroid 2 blocks can also be found in the pre-packed plugins. For example, inside Jet Plugins, a user will find the design components that are usually missing. Avada provide its owner with 50 content blocks. They can be found inside Avada’s custom tool – Fusion Builder. Unluckily, the only form of UI elements Avada has is… shortcodes. Thus, you’ll need to go to default WP editor and use Element Generator to insert the needed blocks. Buying Divi, you will get 37 content blocks. What’s wrong with them? The thing is that the template doesn’t have complex UI presets. It means, you can take the adventure of ready-to-use designs. You should do everything by hand. Now you know how many pre-designed blocks each of the flagships has, so what about the layouts? The regular sale of Monstroid 2 (single site lifetime license) is $75. Besides, you have free, 24/7 technical support that never expires. 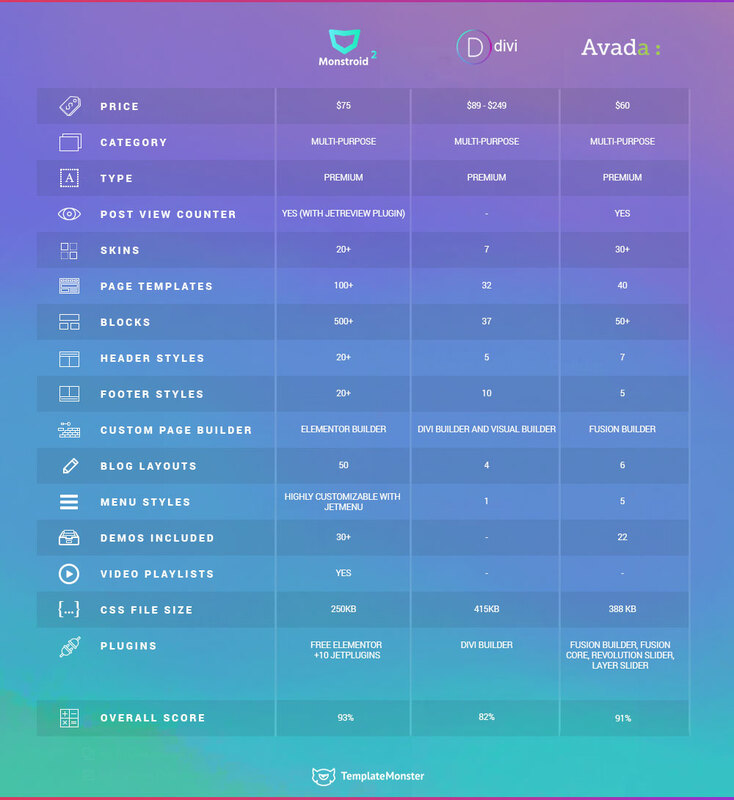 Avada costs you $60 but the technical support lasts only 6 month. You can make extra payment ($18) to get 12-month support. If you gonna choose Divi, note that you can’t get just this template. ElegantThemes has 2 paying plans, which open access to all the 80+ ET’s templates. 1 year costs you $89 and lifetime access takes you $249. There’s tech support for both plans. As expected, the new Monstroid 2 update brings you 10+ plugins exciting plugins. Inside Divi, a user gets you the default functionality and editor. The only plugin the template provides you with is Divi Builder. Avada comes with WYSIWYG-friendly Fusion Builder. Alas, it doesn’t show content blocks on frontend. You’ll need to drag-n-drop them without preview. Choosing Divi, a user gets real-time Divi Builder with WYSIWYG functionality. It also has a library, which contains 22 layouts. You can add your own as well. As promised, now it’s time to take a quick view at Monstroid 2 update. What are the new features Monstroid lovers will get within the recent version? Elementor becomes even more comfy! Now you will get new settings and new opportunities. Monstroid 2 update brings us Magic Button. This incredible thing allows mixing the templates. Now you can take any ready-made page from one set and add it to the page from the second set. 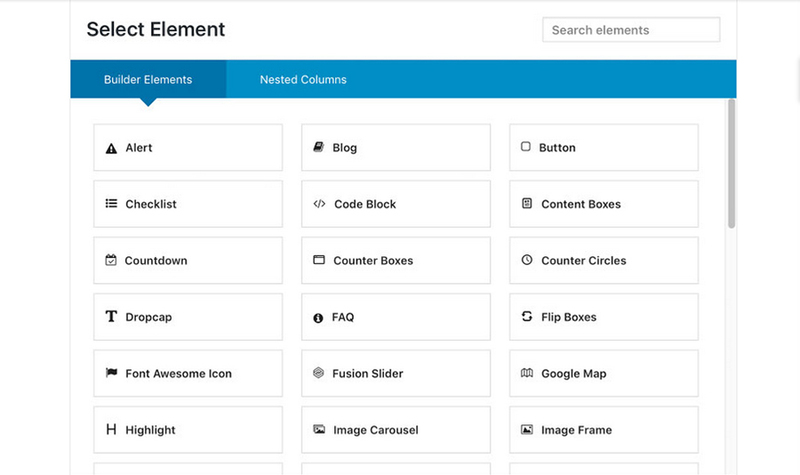 There are 500+ new UI elements and 500 more coming soon. New skins that are released every week. New update promises you unbelievable loading speed. Now it’s only 250 kb, which means a few times faster and lighter than before! Mondtroid 2 comes with a charming JetWooBuilder plugin, which provides everything and anything you may need for an eCommerce website. Customize your shop quickly thanks to multiple e-store-related tools! Each of the plugins brings new functionality to your web design.You can visit Jet Plugins page to get more information about the items and their options. As you can see, all 3 flagships – Monstroid 2, Avada, and Divi – are worthy of your attention. We can’t say there are no disadvantages at all but these are the most popular and comfortable WordPress templates you should certainly check out. Thanks to the trendy WYSIWYG-friendly design, Monstroid 2, Avada, and Divi allow a code-free website creation. To sum everything up, take a closer look at the comparing infographics below.